Are you going to watch The Mindy Project tonight? I read the pilot a few months ago, liked it fine, it didn’t bowl me over. When I watched the premiere, I thought the show did a great job of cycling the Mindy character through a million outfits, more amused than I thought I’d be by the romantic-comedy construct, didn’t really care for the best-friend character. But I get this weird feeling that that’s not good enough. Last week Sasha and I traded a few emails that rambled all over the place and ended when she apologized for not liking Kaling and I was shocked that she thought I’d care. But there’s a feeling out there that I should care, that we both should. I’m supposed to like Mindy Kaling more than I do, and something about that feels really weird. Like we’ve been caught saying something bad about the most popular girls in junior high. We’re told The Mindy Project is the best comedy of the fall (which it may well be). We’re also all supposed to accept that Mindy Kaling is the latest thinking-girl’s hero. She’s got a great job but a crappy love life! Her body isn’t “perfect”! She makes mistakes with men, even though she’s intelligent! She’s supposed to be us. The formula here isn’t new – this is Liz Lemon and Leslie Knope, among others. But there’s something that feels different. Mindy Lahiri (the fictional Kaling) is prickly; she’s kind of rude to waitresses (I know the dismissing the call scene was supposed to be funny, but it seemed like a really unintentional study in classism -- am I thinking about this too much? ); she’s offended at the idea of herself as a drama queen; she’s completely confident in her own abilities as a doctor and a girlfriend, until she’s not. In short, she’s not very self-aware, because we, the audience, can clearly see the mistakes she’s making even when she can’t. I read over those words, though, and they sound like a great construct for a show. You want a character who’s complicated, who has flaws – that’s what makes a compelling personality that people want to watch. Still, something’s making me uncomfortable. Maybe that’s why this junior high feeling is back. Knowing you don’t necessarily like someone without being able to say why…? The giant rush of press about Mindy Kaling in the last month or two has been all about her confidence. B.J. Novak says she fakes it ‘til she makes it, and of course, there’s the famous story in her book of when she fought with her Office boss Greg Daniels, stormed out, and her mother had to remind her to go back. Then there’s the stuff about her show – the writing room boasts many more men than women (an exact count has been hard to find, but it seems to be 7 men to two women, one of whom is Kaling), and so does the cast. In fact, fictional-Mindy seems way more concerned with men’s opinions of her than with women’s. Which is good! Sort of. We don’t see her all insecure about what the mean girls at the wedding thought of her – it’s all about dudes. I mean, I’m glad she’s not falling victim to mean girls; no popular girl would dare, at least not publicly. Right? So why am I still so uncomfortable? I suspect it’s because Mindy Lahiri and Mindy Kaling are incredibly similar. Late-blooming geeks who came into their own, they are now absolutely sure about their brains and professional lives. So much so that Mindy Lahiri spends the episode being kind of dismissive to anyone who tells her she’s wrong: about her clothes, about her billing practices, about whether she should take calls from patients. Fictional Mindy seems kind of mean – and not in a funny way. I can’t get that waitress scene out of my head. I’m not sure I’d like to hang out with her. Even just typing this seems sacreligious. But we don’t address that aspect of her personality. We only see that she’s looking for love. We’re supposed to accept that anything she does in service of finding it is, if not okay, kind of endearing. She’s far from being the only lead character on TV who has that quality, either. Seinfeld wasn’t always nice, neither was Ricky Gervais. Murphy Brown was a prickly woman – but nobody was pushing me to feel like Candice Bergen was also supposed to be my best friend. Do we have to love Mindy K? If we don’t, does it affect our relationship with Mindy L? I suspect this needs more investigation and I’ll start with tonight’s episode. But when the actor doesn’t want you to separate them from the character, can you judge them both the same way? 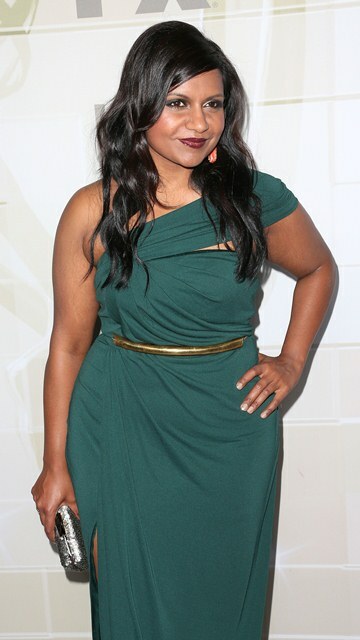 Attached - Mindy Kaling at a Fox 2012 Emmy Nominee celebration in Los Angeles on September 23, 2012.